When you�re racing downwind, good spinnaker trimming will make a huge difference in your overall speed. But don�t forget about your mainsail. Too many sailors round the windward mark, let the mainsheet out, and then leave the main alone. But on many boats the mainsail is actually bigger than the spinnaker (or there may not even be a spinnaker!). So if you want to go fast, you have to keep working hard to fine-tune your mainsail trim. 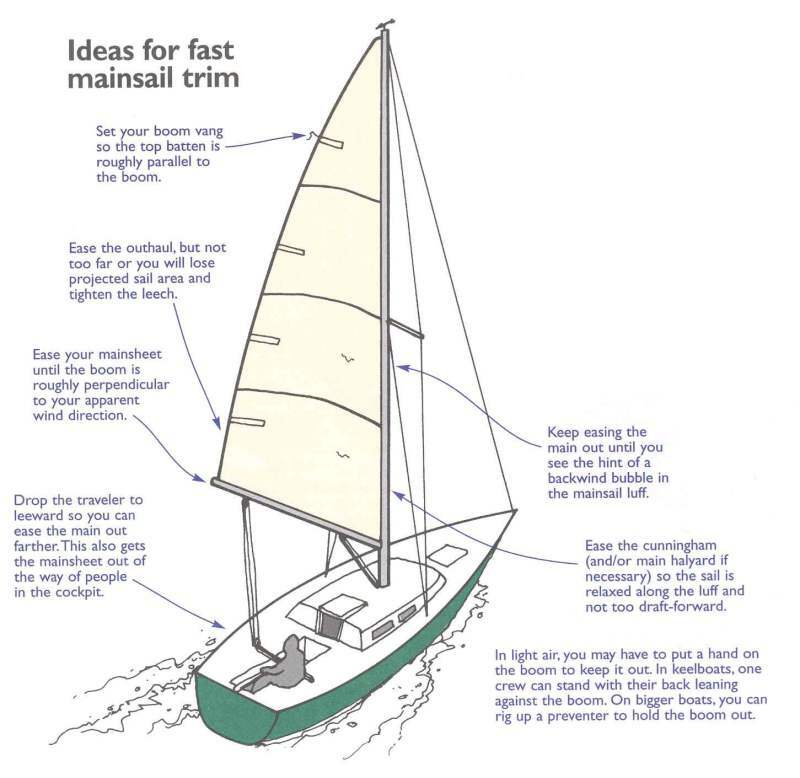 The two basic rules of thumb for trimming a mainsail are almost identical to those for a spinnaker: 1) Always let the sheet out as far as possible; and 2) Keep adjusting the sail constantly for changes in wind velocity or angle. It�s not usually too hard to get your mainsail trim in the right ballpark when you are running. There are, however, two mistakes I commonly see. Both are very slow. The first error is overtrimming the mainsheet. This is bad because you lose projected area in the sail. Basically, you want the boom (and therefore the chord of the sail) to be roughly perpendicular to your apparent wind. To find the right position, ease the sheet out until either a) you see a bubble along the front of the sail (at which point you should trim it back slightly to remove the bubble); or b) the boom hits the leeward shroud(s); or c) the boom reaches an angle of roughly 90� to (the centerline of) the boat. To avoid overtrimming the main, don�t cleat the sheet. Though the mainsheet is often eased as far as possible during the run, there are always small changes in wind angle or pressure that might require a trim change. If the mainsheet is cleated, odds are that it will be forgotten and seldom adjusted. The second common error is using too much vang downwind. It�s easy to over-vang on a run, but in most cases you want only enough tension on the mainsail leech so the top batten is parallel to the boom. If you pull down too hard, the top batten(s) will hook windward. This reduces projected sail area and will kill any air flow that might be happening around the top part of the sail. Too much vang is a little like overtrimming the sail. It is usually quite slow, especially when you have light air or lumpy seas. Another time you definitely want a looser vang is when you�re sailing a boat where the leeward shroud prevents the boom from going out all the way. In this case you cannot get the bottom of your sail perpendicular to the apparent wind. By easing the vang, however, you allow the top of the mainsail to rotate forward so it may be 90� to the wind. This trim is fast. Beyond easing the sheet out far enough and not tensioning the vang too hard, there are several things you can do with the main to make your boat go faster on runs. � In lighter air you may have to hold the boom out, especially if you are heeling to windward. When you do this, try not to pull down on the boom since this will likely create too much leech tension. � Trimming the mainsail and spinnaker often go hand in hand. For example, when you ease the spinnaker sheet you may be able to ease the mainsheet, too. If the two trimmers communicate, they can often help each other. � On smaller boats, many helmspersons play the the main by holding the sheet directly as it comes from the boom. By skipping the ratchet block you get a better feel for the sail, plus it�s easier to pump it out and let the sail out. � You almost always want less mainsail luff tension on a run than on a beat. This is partly because the mast gets straighter downwind and you don�t need luff tension to pull the sail�s draft forward. In fact, you want the draft further aft so you should ease the cunningham completely and even lower the halyard if necessary to get a nice fair shape in the sail. � The air flow around the mainsail is mostly stalled when you�re sailing downwind, so don�t rely on telltales (either on the leech or near the front of the sail) to give you much information about trim.